The Red Ribbon Campaign is the oldest and largest drug prevention program in the Nation and a way for people and communities take a visible stand against drugs and a fun and effective way to talk to kids about the importance of staying drug free. 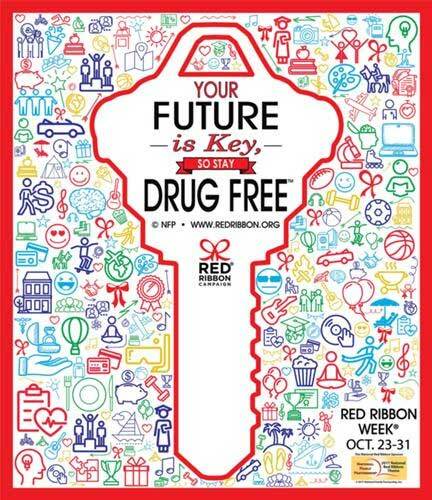 This year’s theme is “Your Future Is Key, So Stay Drug Free. The National Family Partnership is hosting its annual contest to raise awareness about staying drug free. The contest gives students in grades K-12 a chance to win an iPad and $1,000 for their school. 2. Schools may submit a photo of a school decoration. Schools, decorate your school campus with a Red Ribbon (double-looped) with this year’s theme. Take a photo of your Red Ribbon decoration, then upload to www.redribbon.org. You must be 18+ to upload your photos. Get votes – ask your friends, family, colleagues and school contacts to vote for your photo on the redribbon.org website. Entries with the most votes will win an iPad and $1,000 for a local K-12 school.